Create a frenzied school of baitfish in seconds! Perfect for shore dives. Perfect for travel. Inside the waterproof floating canister is an easy to use line winder, with lanyard and a 1.5 ounce weight which connects to your own flashers or the optional “MAKO Spearguns Fish Flasher Strips”. 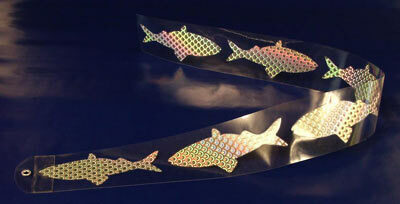 The optional, lightweight, yet durable, plastic Fish Flasher Strips have 6, double sided and highly reflective holographic fish which create the excitement needed to bring in the big ones and keep them around. DO IT YOURSELF. These Fish Flasher Strips are so versatile and effective, you can hang multiple fish strips on a single line to create a large school of baitfish, swimming wildly in the current. Working from the surface and tugging on the line, you can create a frenzied like appearance for enhanced attraction. For Rapid Deployment, simply unscrew the waterproof floating canister and deploy your flasher rig and re-cap the canister. Then, clip the line winder to the floating canister and simply unwind the mono line, instantly releasing your shiny school of baitfish. High-Vis Canister which also serves as a Flasher Float and a convenient container for travel. NOTE: Add from 1 to 4 flasher strips on drop down menu.